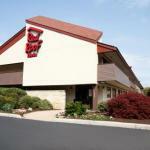 Featuring free Wi-Fi and parking the budget-friendly Red Roof Parkersburg also offers a convenient location off I-77. The two-story Red Roof has 105 exterior-access rooms with Wi-Fi cable TV coffeemakers free long distance ironing gear and hairdryers; some rooms also have mini-fridges and microwaves. Free fax service and meeting facilities are among the other amenities offered. Parking is free and pets are permitted for a fee. The Red Roof Inn is off I-77 east of downtown Parkersburg. Major attractions such as Blennerhassett Island Historical State Park Mountwood Park the Smoot Theatre the Parkersburg Art Center the Little Kanawha Crafthouse and Grand Central Mall are five miles or less from the hotel. West Virginia University at Parkersburg and South Hills Golf Course are 10 minutes away. The Fenton Art Glass Company Marietta College and Marietta Memorial Hospital are 20 minutes from the hotel in Marietta Ohio. Mid-Ohio Valley Regional Airport is 10 miles away.